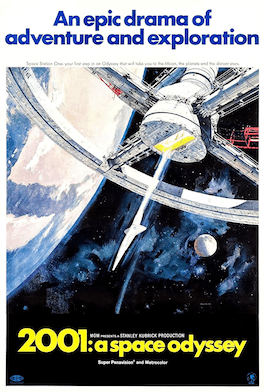 “`A non-restored 70mm cinematic print of Stanley Kubrick’s iconic masterpiece, 2001: A Space Odyssey, returns to select theaters in celebration of the film’s 50th anniversary. Warner Brothers will release the film for home viewing later in the year in 4K resolution. “`The work will premiere at the Cannes Film Festival on May 12th before its re-release on May 18th. Filmmaker Christopher Nolan will introduce the screening at Cannes, where the members of Kubrick’s family will also be in attendance. Kubrick died in 1999. “`This production has pioneering technical effects, and it features orchestral music from Richard and Johann Strauss. The film’s title was chosen because it was the first year of a new millennium and the next century; which at the time, seemed a long time coming. “`The richly eloquent film about space travel and the discovery of artificial intelligence; years prior to Close Encounters of the Third Kind, ET: The Extra-Terrestrial, and Star Wars, was based on the published 1951 short story The Sentinel. It was written in 1948 by British science fiction author Arthur C. Clarke. The movie was strongly influenced by director George Pal’s Conquest of Space. “`The non-restored flick, created from the original camera negative, will allow audiences to experience it as they did after the film premiered in 1968. Give ’em Hal !! This entry was posted on Friday, March 30th, 2018 at 12:17 am	and is filed under Blog by Manny Pacheco. You can follow any comments to this post through the RSS 2.0 feed. You can leave a response, or trackback from your own site.